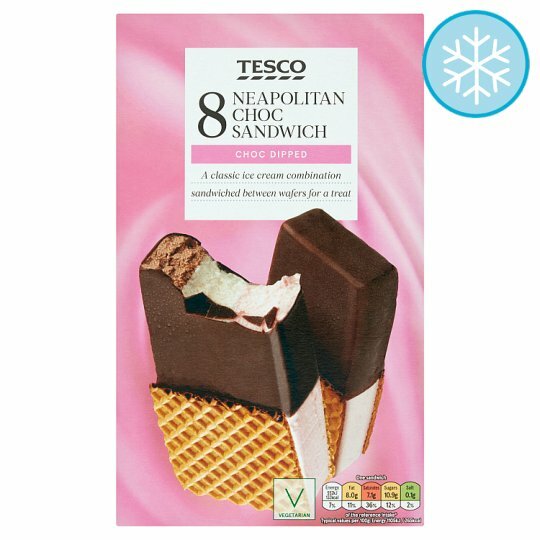 8 Individually wrapped strawberry, vanilla and chocolate flavoured ice creams in biscuit wafers, dipped in a chocolate flavour coating. Partially Reconstituted Whey Protein Concentrate (Milk), Reconstituted Skimmed Milk Concentrate, Chocolate Flavour Coating (13%), Sugar, Coconut Oil, Glucose Syrup, Wafer (3.5%), Strawberry Purée (2%), Fat Reduced Cocoa Powder, Emulsifier (Mono- and Di-Glycerides of Fatty Acids), Stabilisers (Carob Gum, Guar Gum), Flavouring, Citric Acid, Beetroot Concentrate, Carrot Concentrate. Chocolate Flavour Coating contains: Coconut Oil, Sugar, Fat Reduced Cocoa Powder, Shea Oil, Sunflower Oil, Emulsifier (Soya Lecithins). Wafer contains: Wheat Flour, Sunflower Oil, Caramelised Sugar Syrup, Sugar, Wheat Protein, Emulsifier (Soya Lecithins), Raising Agent (Sodium Bicarbonate), Salt. For allergens, including cereals containing gluten, see ingredients in bold. The allergens in this product have changed, may contain egg. Also, may contain peanuts and nuts.